... and that is how we wound up shooting an offline tower voluntarily. The End. There are many reasons to join a corporation in Eve Online. The structure of the game is not kind to the solo player. The game it also very, very lonely. I've argued in my defense for local that the simple ability to see other people and know that you are not alone is more important than any number of information gathering or strategic reasons to remove local chat. Nor is local chat only a place of smack talk, scams, and negativity. I had a lovely chat with some boys from Northern Associates. who were camping Bosena's gate for some reason and asked me to write about them (wink). Loneliness kills off new players. Communities invest them in the game. This is demonstrated by groups that create a social environment to bring the player in and give them a home. It is one reason why many have a hard time leaving the warm comfort of Eve University despite the corporation's goal to train and move on. I often speak to people who are in corporations because "they are good guys" but there is nothing else there and they find themselves bored and disengaged. 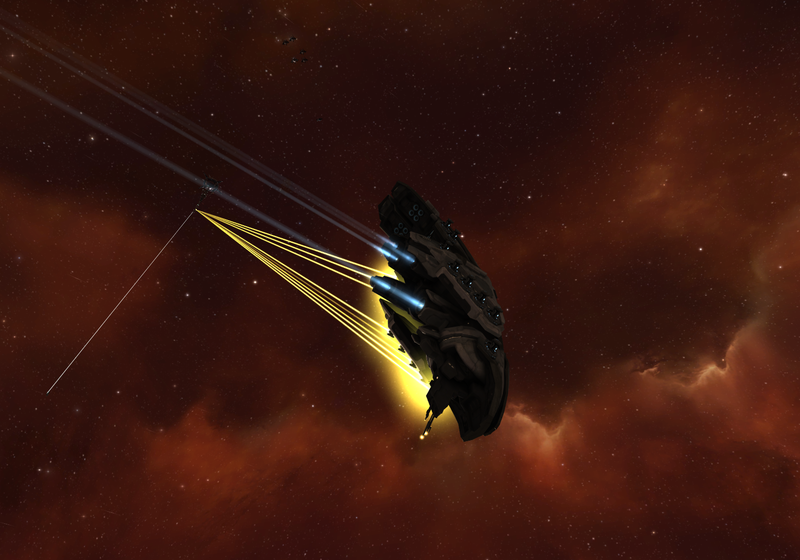 This particular day, I was listening to some high sec denizens be bitter in Eve Uni chat. They are people who have decided not to leave high sec and spend their time doing missions or incursions. Everything is terrible about the game. They are bored and the game is so bad that they have to have other stimulus to play. I made the mistake of piping up and telling them that I was riveted by what I was doing. I was beaten back by choking waves of negativity and retreated to the comfort of my corp chat. I happen to know none of them had that particular escape. You see, while they were doing endless incursions and complaining that Eve was not interesting I was finding one of the most boring activities incredibly fascinating. On coms Kaeda sighed. "This is is going to take forever." "What are you doing, Kaeda?" "Not really but I can use the material for my reactions." "I'll be right over with an Oracle." "This will take all day, Sugar." As I found my Oracle, put some T1 crystals in it, Naoru who was in coms with us asks, "Want a dread?" "It would be nice..." says Kaeda. "I'll get you a cyno," I told Naoru. And that is how Kaeda wound up with help. Quickly and voluntarily. No CTAs. No demands. He warned everyone that it was a large tower. Now, shooting an offline tower is not in itself fun. But Kaeda is my friend and he has always helped me and others out. Why are we in a corporation if we don't help each other? I know some corporations and alliances function just fine as a cesspit of personal selfishness. I'm not interested in that. I find the fun in the teamwork side of it. After I jumped in and Naoru jumped in we started logging in alts. I got the cyno in for the dreadnought. Then we had to sort some ammo. Naoru was duel boxing at the time and not paying attention to his dread until he died. That conversation was amusing in itself. I said that he trusted us to watch his back. He said that he must not care enough about the loss. I decided that my version sounded better. What are these ships to be if not used? Our discussion wandered around that. Naoru needed more stront at one point. I had a cloaky hauler buzzing around to help with supplying runs. Capital ships require upkeep. Jump fuel, cyno fuel, cyno accounts, stront, big awkward to move ammunition. With his dreadnought resorted I went to settle above the modules we would need to unanchor with my cloaky hauler. Other people had eyes scattered around the surrounding systems and everytime neutrals came in the dreads decycled and prepared to leave. 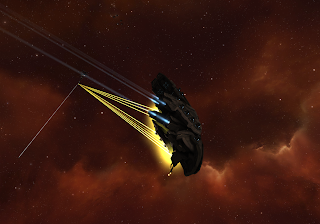 Allo wandered in and donated a Dreadnought to the cause and Wex also bounced over to assist. Suddenly, we had a nice tower bashing fleet (2x Moros, Megathron, 3x Oracle, something else random) and a large tower going from laughing at us while we raged and wept to rapidly dying. And we talked. Subjects wandered all over the place. We talked because we like each other and enjoy each others company. Over the course of our conversation it often wandered back to how bad the mechanics for removing off-lined towers was. Now, I do agree with Kaeda that some better system for offline towers should be established. From them no longer having shields (maybe?) or a decreased amount of hit points for an offlined tower to the suggestion of a hacking module or hacking deployable that we came up with on coms. I think that CCP is ignoring the tower issue because they are trying to solve it with the deployables. Eventually, these towers will be gone with only memories of a terrible piece of code. At half structure we warped the dreadnoughts off the field. Structure bashing is dangerous at any time. This is also where the new deployable cyno jammers will come into play. They will be worth the cost just for the protection that they will provide. The ships can still warp in but that is time and time is what we are always short on when PvP happens. As it was, we were left alone. The tower came down and we unanchored and scooped the modules. One of the nice things about towers is that once the tower is gone all undamaged modules can be unanchored and reused or removed. Damaging the modules means they cannot be unanchored. The modules do not have the hit points of the tower but they are still irritating to kill. While a few damaged modules were destroyed I cleaned up the structures, Kaeda planted a new tower, and we were done. While not classically, 'fun' as in adrenaline rush and blood pounding, I find problem solving to be engaging. I take helping others personally. I've often needed help with things in my Eve career. As much as I try to be self sufficient, sometimes I simply need other people. I've been turned down for POS help before and it sucked. I will not become angry at someones decision to use their free time but it does leave me disappointed. Kaeda has always stepped forward to help me with things. He lit endless cynos for me during the solitude deployment. Cynos are not "yay weee, I'm a stationary beacon for 10 minutes! It's what I always wanted to be when I grew up!" type of fun but they are integral to our activities. I cannot imagine seeing him needing a few more bodies and not tossing mine onto that pile. This is all me, however. Everyone takes their relationships differently. I take my corporation interaction seriously. Would I want to clear structures every day? No. And I am not being asked to clear them every day. I wasn't even asked to help with this one. I volunteered. Because I wanted to. Because helping my corpmates is as engrossing and satisfying a part of my game experience as anything else that I do. Excellent piece of writing. Your corp sounds great. That's probably the only upside of ad-hoc structure shoots: they can be eminently social. It's pretty much the only reason why I still volunteer for those, despite not flying dreads. Lol this reminds me of my first pirate corp. We ransome a faction tower in high sec and the corp called our leaders bluff so we spent the next litterly 20 hours rfing this tower with like 10 bs. Lucky for us the bears decided to pay us so we didn't have to come back. Your post describes exactly what so many, including I, look for in EVE. Congratulations on finding it.